Raj Swasthya District Mental Health Program. 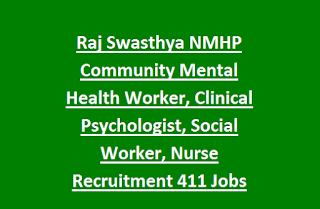 Available Posts are Psychiatrist, Clinical Psychologist, Psychiatric Social Worker, Psychiatric Nurse, Community Nurse, Case Registry Assistant, Monitory and Evolution officer, Ward Assistant and Community Mental Health Worker Jobs. All the posts are contract based only. 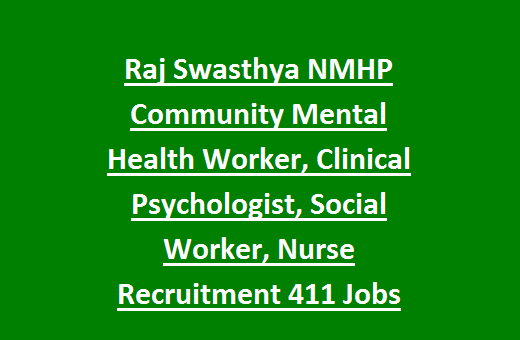 Total 433 vacancies are going to fill through Raj Swasthya NMHP Rajasthan State Health Society. Eligible candidates can submit their application form to NMHP jaipur along with all required documents to be reachable on or before 25-11-2017. Based on candidates marks in educational qualifications, previous experience a merit list/short list will be prepared. Those candidates only called for the interview process of Raj Swasthya NMHP Recruitment 2017. 411 vacancies available in Rajasthan State Health Society NMHP under district and sub district level. For post wise vacancies please refer the official notification. For Psychiatrist, Clinical Psychologist, Psychiatric Social Worker and Psychiatric Nurse jobs application fee Rs.700/- and for all other posts Rs.500/-. Candidates have to take a demand draft in favor of "State Nodal Officer" payable at Jaipur. Selection for Rajasthan State Health Society vacancies will be held based on candidates previous work experience and marks secured in qualifying exam. Eligible candidates can download the application form from Rajasthan State Health Society official website of www.rajswasthya.nic.in. Fill all the details and attach the required documents of self attested age proof, educational qualifications, and experience, caste certificate. Send application form to NMHP address to be reachable on or before 25-11-2017. Govind Marg, Sethi Colony, Jaipur-302004.